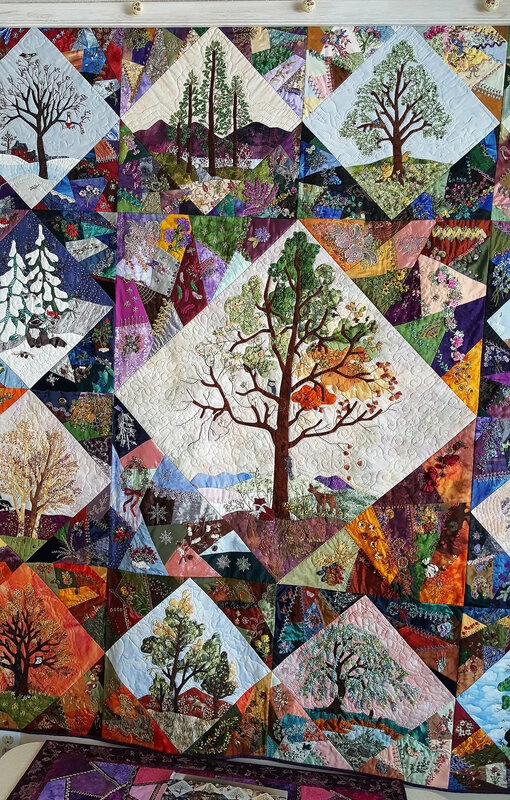 We are honored to be able to share quilts constructed by all of you who have created your own version of the Times and Seasons Calendar quilts and other Piecemakers patterns. 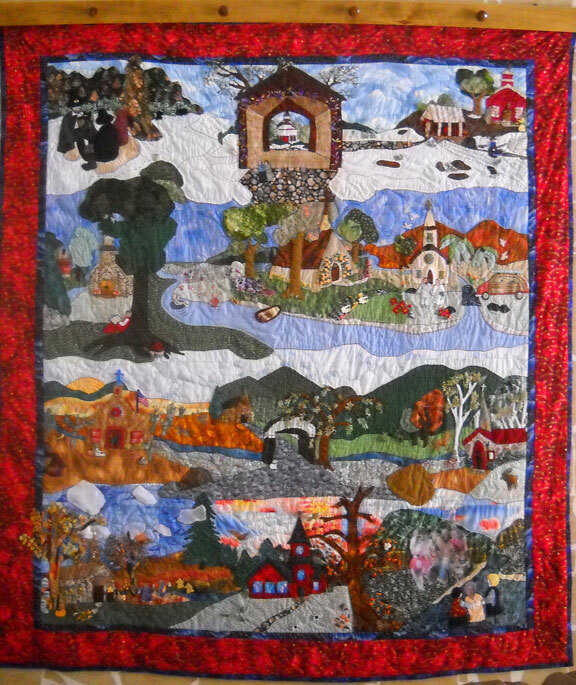 If you would like to have your quilt or wallhanging displayed in the "gallery", just email the picture to <mail@piecemakers.com> or send a photograph to Piecemakers, 1720 Adams Avenue, Costa Mesa, CA 92626, Attn: Art Dept. 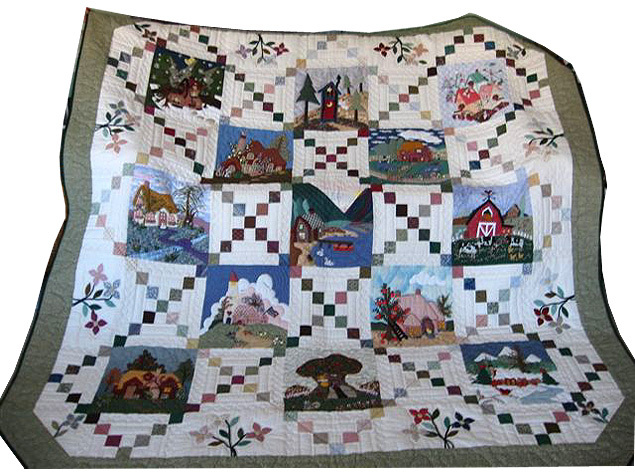 Please include any special stories about the making of your quilt, prizes it won or any other information that is important to you. 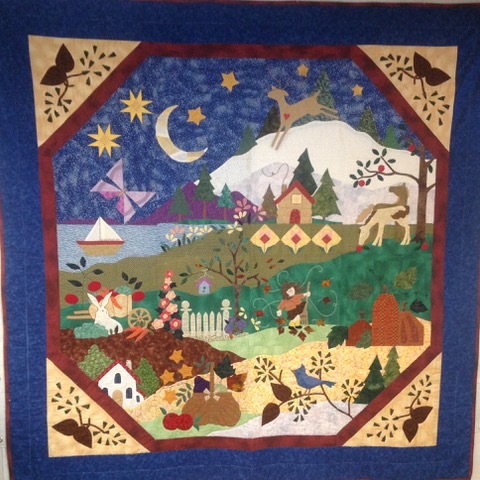 Edie wrote, "This Piecemakers quilt was started in 2010 after many, many hours of study on the instructions supplied with the kit; ribbon embroidery was new to me but once started I really enjoyed the technique. The project took nearly two years to complete since I was interrupted by a move to a new home! 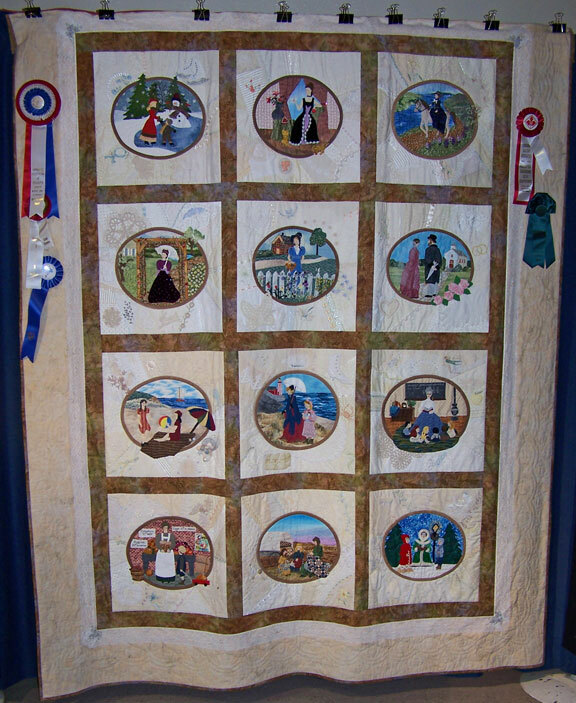 Once finished and returned from long arm quilting by artist, Jean Shute, and finishing touches were completed the quilt was entered in the Independence Hall Quilters annual fair in Murphys, California. I was thrilled to win VIEWERS' CHOICE. 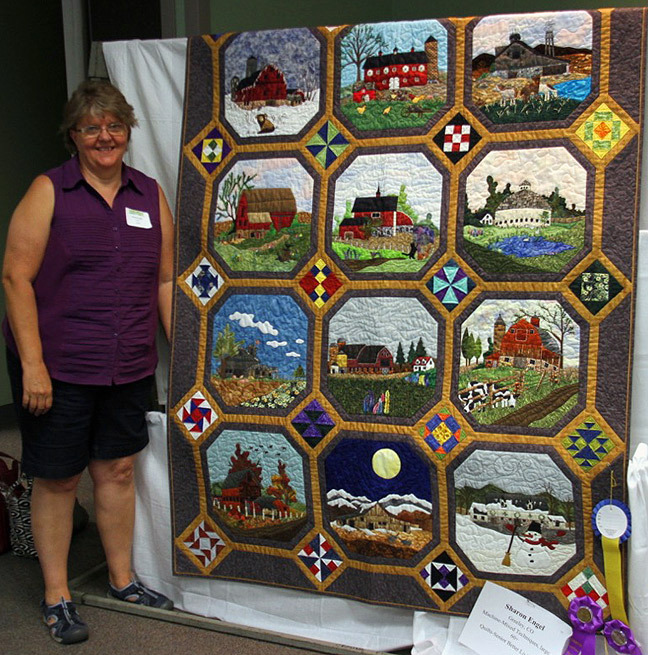 When entered in the North Idaho Quilters' Show in Coeur d'Alene, Idaho, in 2017, the quilt won the 1st Place Ribbon plus the Featured Quilter Award. It now graces the wall of our guest bedroom and continues to earn many praises from house guests. Thank you Piecemakers for an exciting design and a complete and well-done kit!" I have made the 1999, 2000, and a combination of 2010 and 2017 which I changed a little.I love making a large picture." 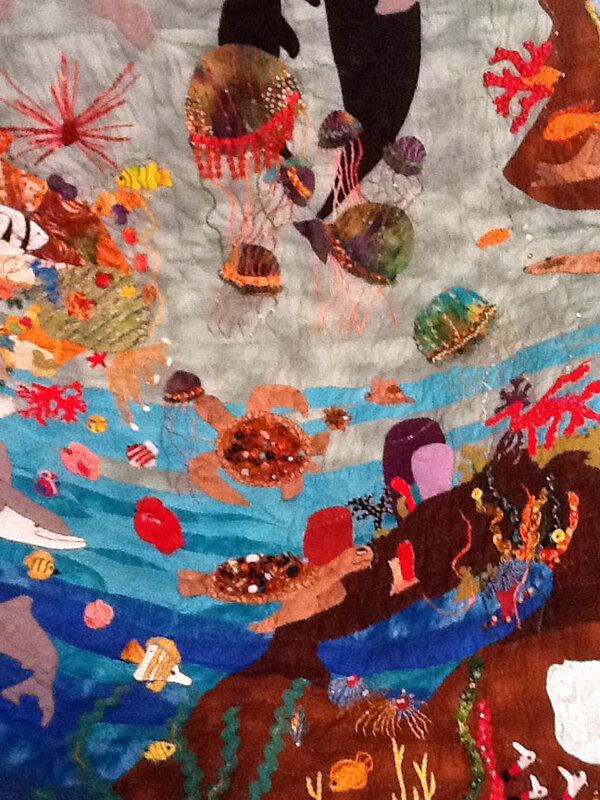 Click on Sandra's quilt to see close-ups of different sections of the quilt. 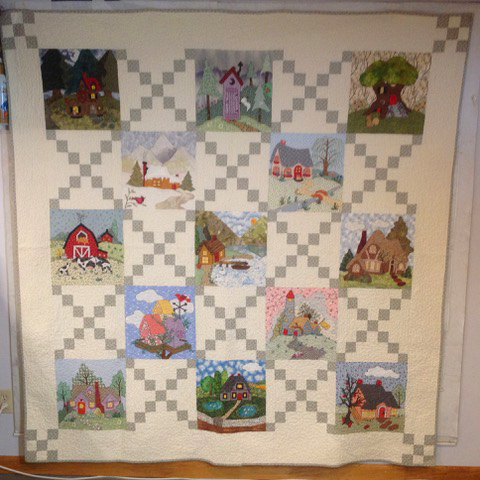 Freda wrote, "My first entry to your blog, completing one of your wonderful patterns, was in May 2015. 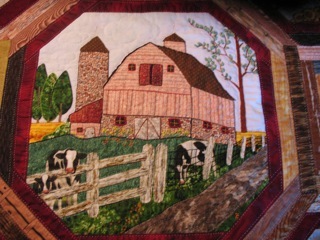 I have now completed another one of your patterns, the 2003 Barns. I used the green to strip the quilt. I did not go completely according to the the American theme, but still enjoyed the variations and ideas of each block. To fit my bed, I had to create 4 extra blocks. Thank you so much for the inspiration of these lovely patterns. 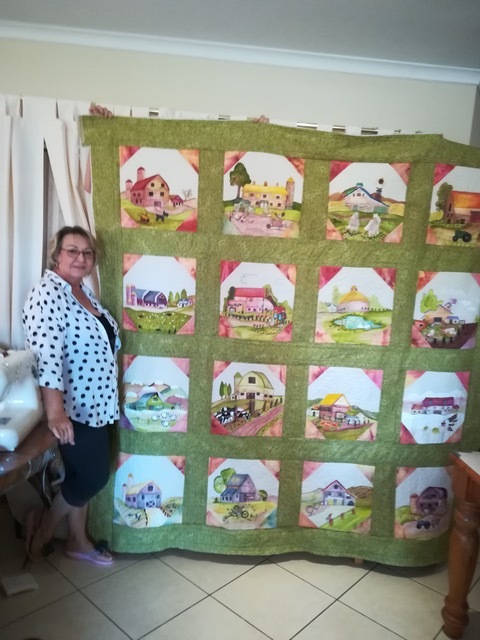 I am also sending a photo of the quilt [shown below] of my friend, Hannelie, who made a lovely quilt of the 2003 Barns, stripping it in a brownish colour. We hope that you can use these pictures in your Gallery to inspire others." Peggy wrote, "The 12 birds took nearly a year." 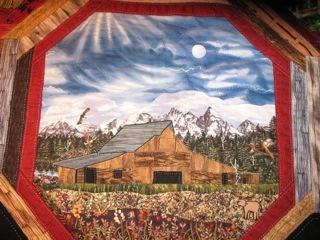 Sara wrote, "[Here is] a pic of the quilt I made using the 2002 calendar design, but adjusted it for my needs. 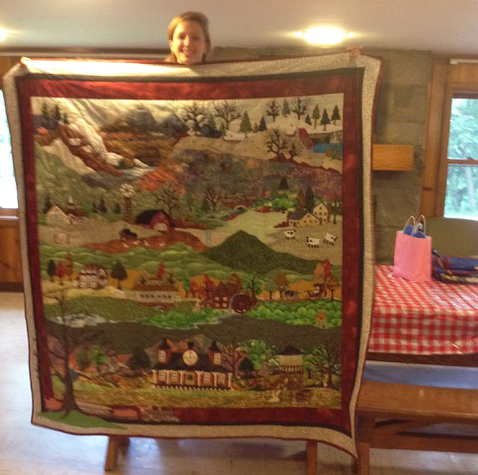 I loved working on this quilt and my niece who received it for a wedding gift also loves it." 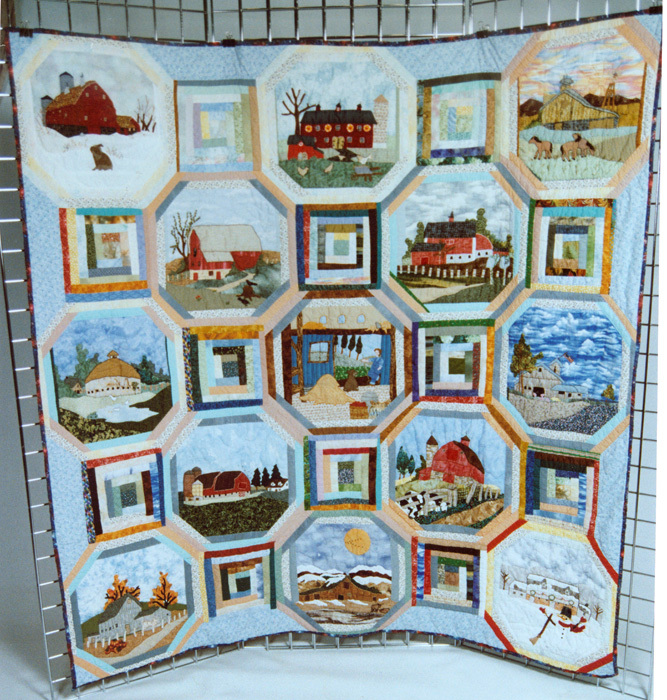 Linda wrote, "Here are my seven Calendar Quilts. 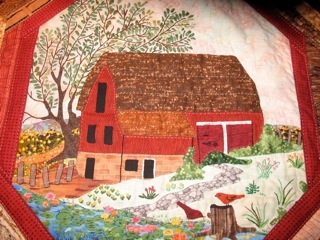 All hand appliqued, needle turn, four are hand quilted, two are machine quilted and one is at the quilters. I'm also starting one and using my favorite scenes from each of them. Thank you for your interest in them. They were a joy to make. I made one for each of my granddaughters and one for each of my sons. I give them to my granddaughters as a graduation gift. As you can see, one already has hers." 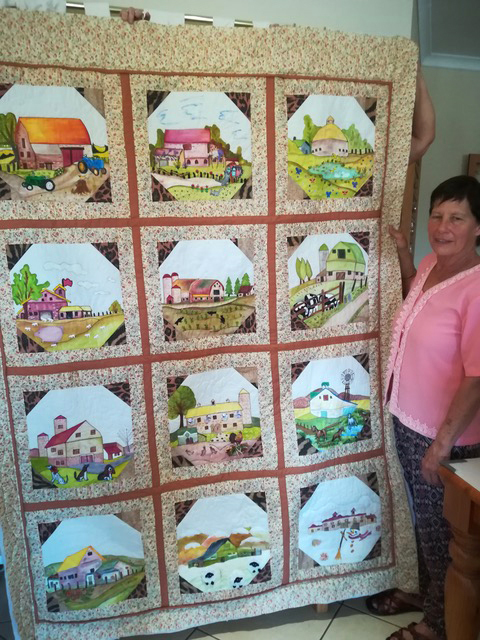 Helen wrote, "I made my version of your 2016 calendar quilt and have been placed second in a competition in the UK - I am delighted!" 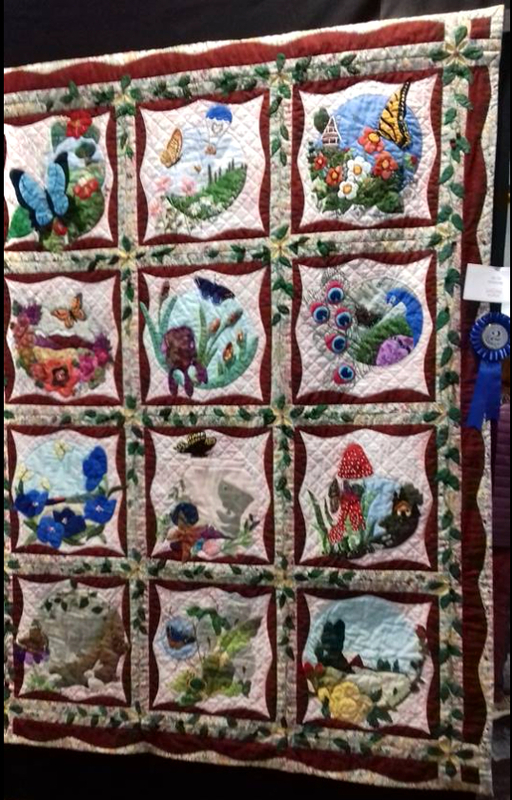 Cindy entered her beautiful quilt in a 2018 quilt show in Grand Rapids. 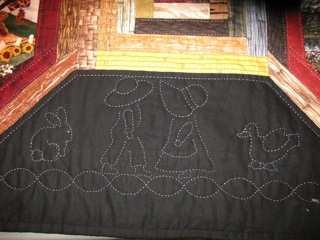 Debbie wrote, "I fell in love with this pattern when it was found in my Glenelg Quilt Group's cupboard 4 years ago after being donated to the group years earlier. 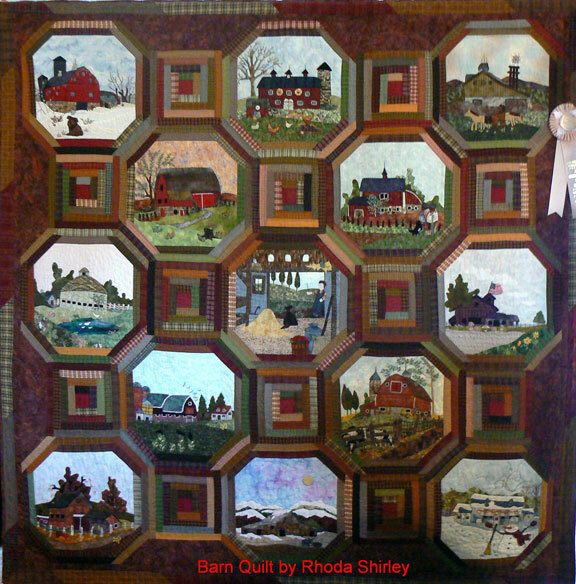 In 2013 I sent away for one of the few remaining partial quilt kits. Living in Australia I didn't think I would see all these trees in real life, however, I found many in our Mount Lofty Botanic Gardens in South Australia - a micro climate on the side of our only mountain in our State that accommodates cool climate trees. 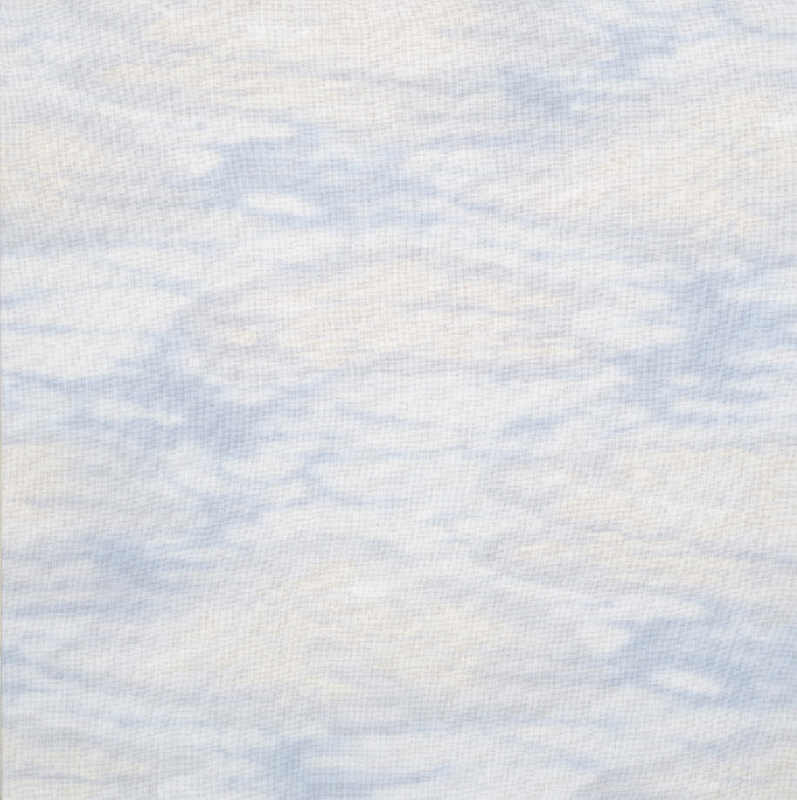 With the support of my Glenelg Quilt group, this pattern taught me so many techniques. I decided to go for finishing rather than perfection and followed the majority of the pattern instructions. Thank you for such a lovely pattern. 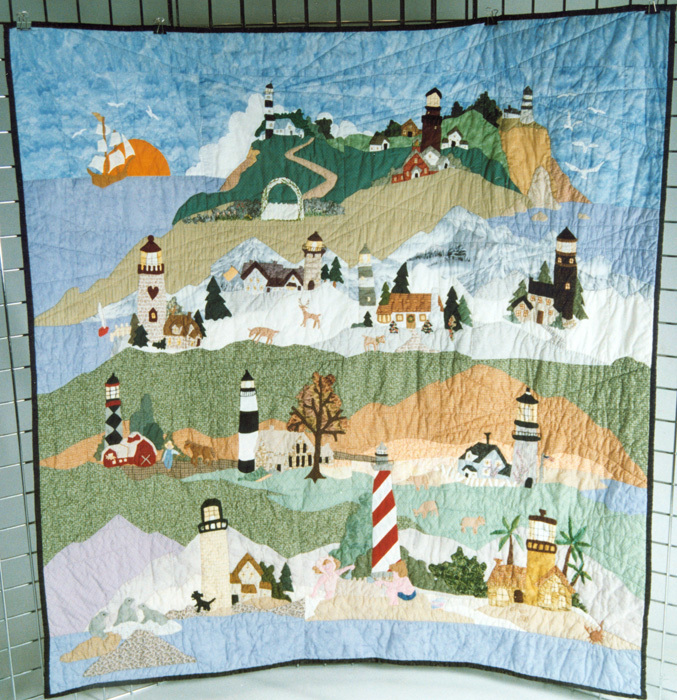 Sandy wrote, "This quilt was started April 2002, completed in August of 2005. My father always was telling me I needed to enter one of my quilts in the State Fair. Unfortunately he passed away in 2000, so when I saw this pattern I knew this is the quilt I would make in his honor. I took an applique class and a silk ribbon class and watched videos and bought several books on the subject. I collected material from different quilt shops while traveling - Seattle & Spokane Washington, Idaho, Montana, Wyoming, and of course the local quilt shops in Salt Lake City area. In these two years I was hospitalized three times for various reasons. The Cherry Blossoms knots were made while recovering and the Weeping Willow leaves were done while I was under the influence of pain medication. Maybe that's the reason I had the patience to do so many leaves and blossoms. I told myself this quilt was going to be in the 2005 State Fair in honor of my Father. I'm really not the competitive type. I just wanted prove to myself I could get out of my comfort zone and do something different. 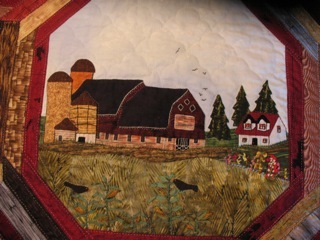 At the State Fair in 2005 it took 1st place in its category and viewers choice and Grand Prize for Home Arts department. Afterwards my friends talked me into entering it at the Springville Arts Show in Springville, Utah, the same year, so that people who didn't see it at the Fair would have the opportunity to do so there. It took 1st place Viewers Choice and Best of Show there. In 2008 I took it to the Masonic Lodge in Salt Lake City where it took 1st Place and Viewers Choice. 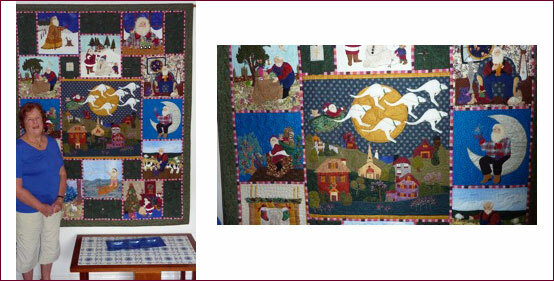 1999 and 2000 Times and Seasons Quilts in miniature! 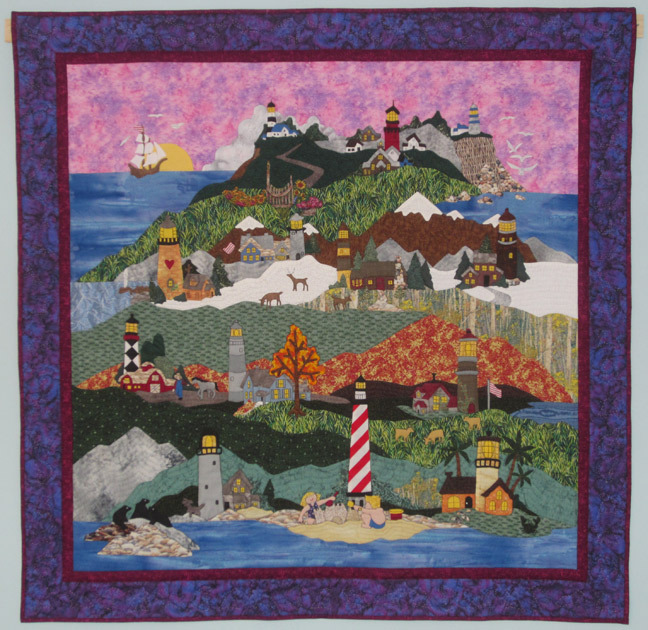 Bea wrote, "I loved the Times and Seasons quilt patterns but they were too large so I minimized them -- the Train Quilt is 33” wide x 33-3/4” high and the Lighthouse Quilt is 39” wide and 38” high -- so I could hang them in my home. 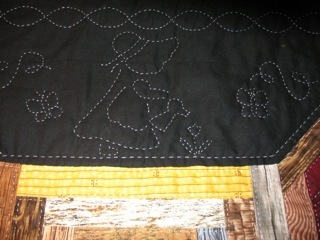 It was a lot of fun finding the material and adapting the embellishments to a much smaller size quilt. Some I had to change completely and others I could go according to the pattern. 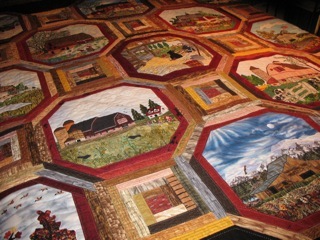 It was an enjoyable experience and quilts that I will treasure the rest of my life. Love your Patterns." 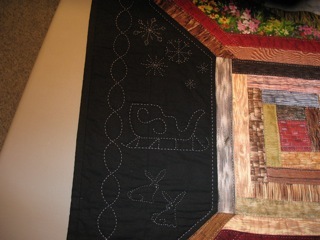 Jan wrote, "Thank you for acknowledging my quilt. 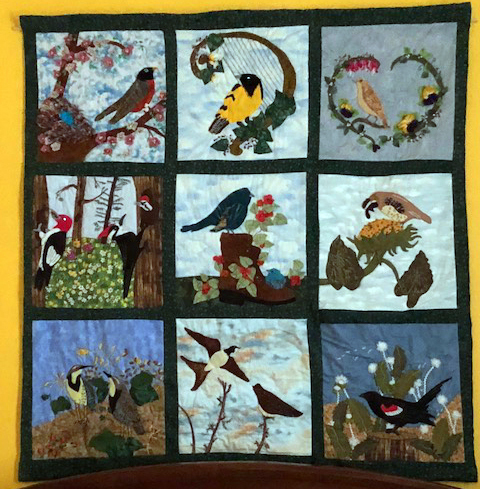 I started the quilt in February and found it so much fun I ordered the 2015 calendar to do the birds. It was a difficult year losing two cats and my beloved beagle Bailey. Hope you don't mind some of my changes. The last square is my idea of the Rainbow Bridge. I needed to do a square to honor their memory and all my pets who I imagine are waiting for me at the Rainbow Bridge. 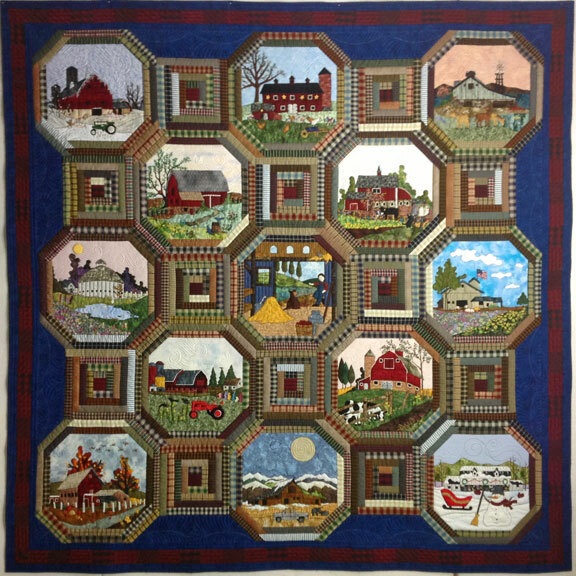 I will think of them each time I see the quilt." 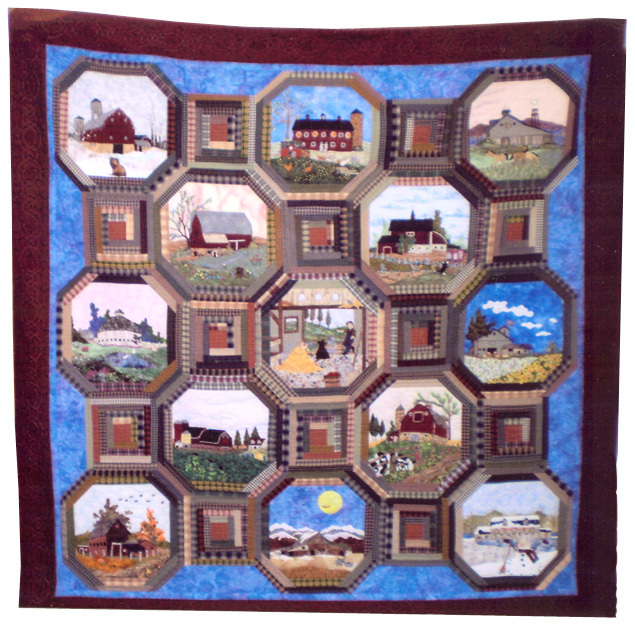 Evelyn wrote, "I have made two of these quilts, one for each of my children. The purpose was to remind them of their roots and for them to remember that their ancestors worked very hard so that they could enjoy the life they live now. 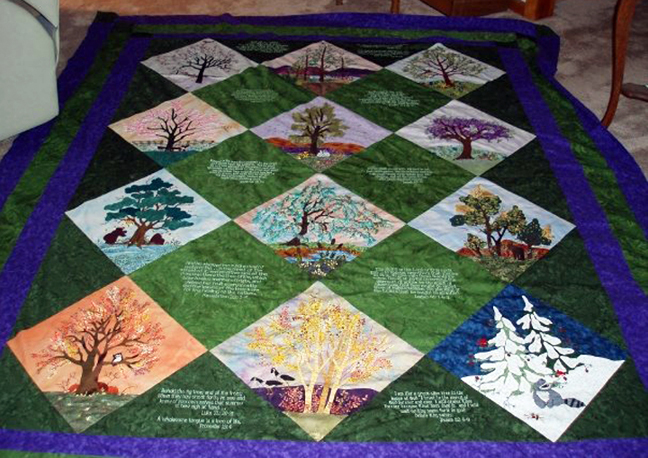 The poem on the back of the quilt sums up what we would like them to carry with them as a foundation of life. I have made minor changes to the pattern. Mainly, the flag, since we live in Canada. 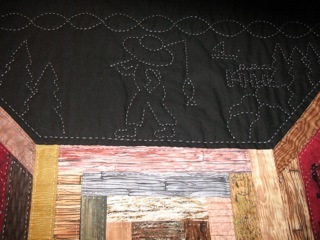 I enjoyed working on this quilt, even though at times, I thought I was in over my head, I persevered. I am pleased with how it turned out. I has the feel of 'a warm hug on a cold day', the feeling that you only get when you are 'home'. To my surprise, I received first place at the Arborg Ag Society Fair. July 17, 2016." 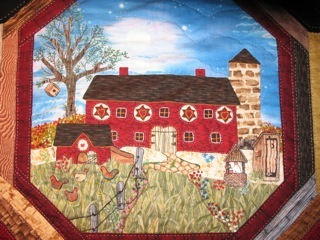 Sharon wrote: "Hello, I received permission from you to enter my quilt in national competitions." 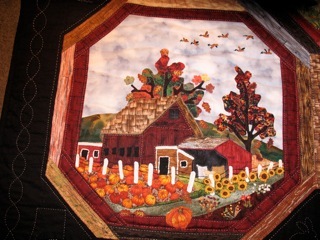 "Hello, I am a quilt judge certified by NQA and also the National Association of Certified Quilt Judges. 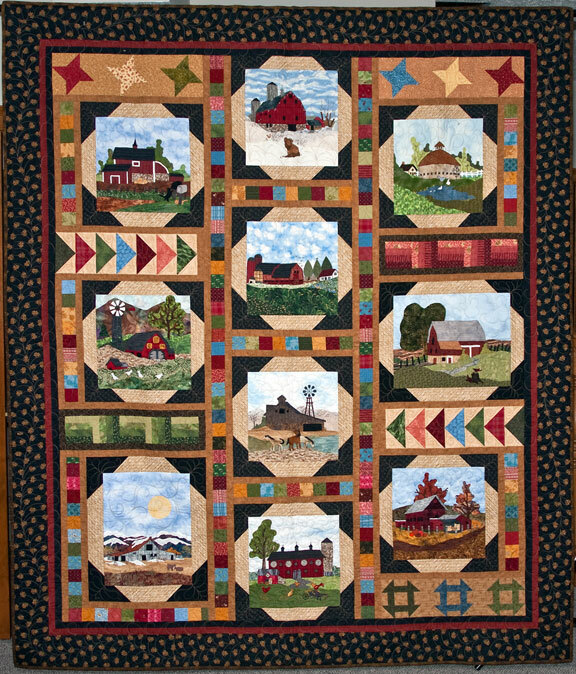 Last week I gave an award to the attached quilt, which the owner says was made from your pattern. 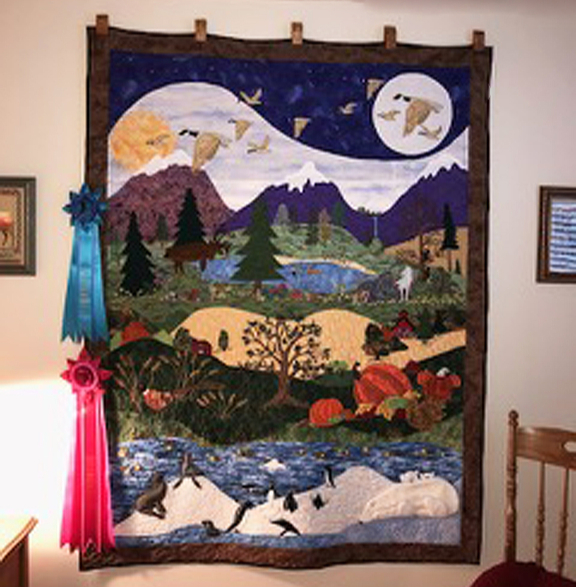 I would like your permission to post the photo and a little information on my public Facebook quilting page, “Christine Brown, Certified Quilt Judge.” The quilt won Grand Champion at the Weld County (CO) Fair judging." 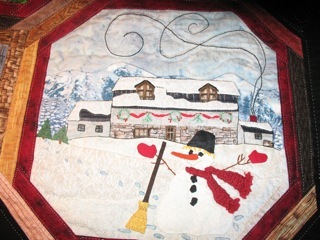 Judi wrote, "The 2007 Times and Season Quilt was started in a block of the month class in January 2007. 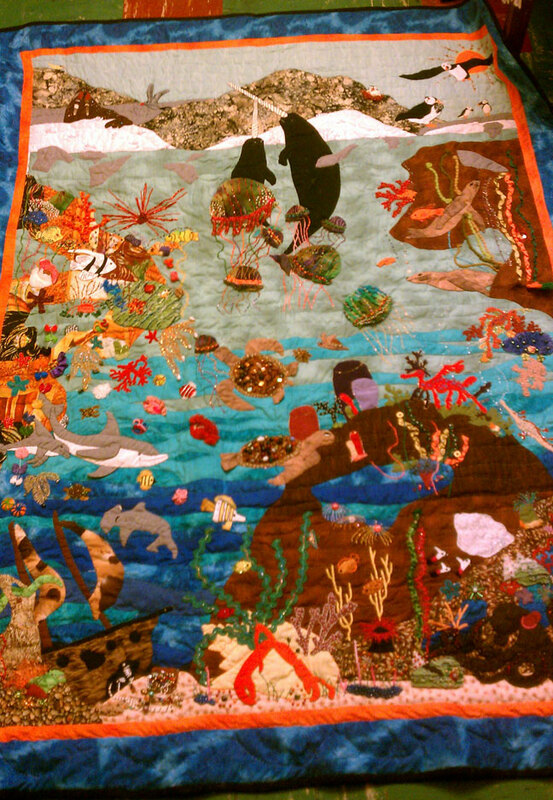 While working on the 2007 quilt, I fell in love with the 2009 crazy patch quilt. 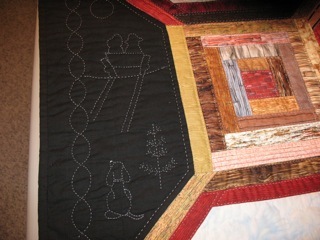 So there was a time that I worked on both quilts at the same time. 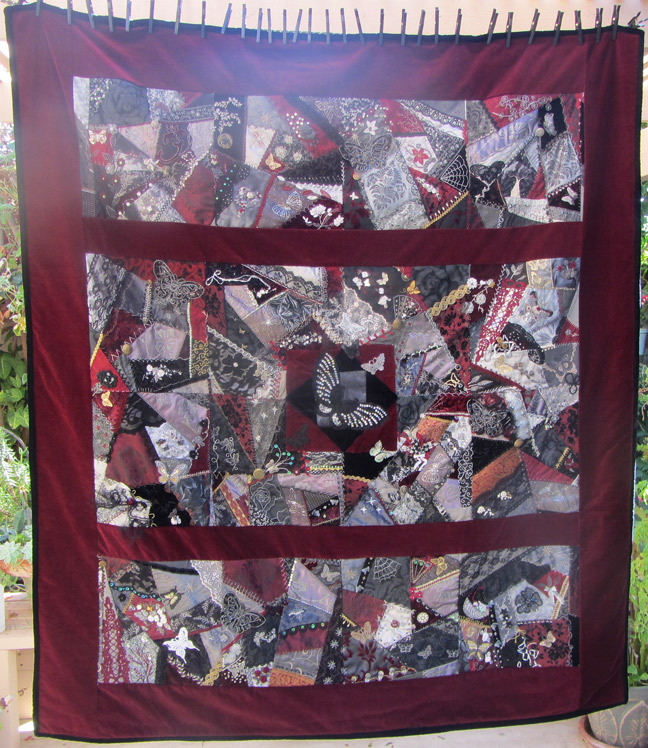 I made the crazy patch with a deep burgundy color to go with the colors of our bedroom. 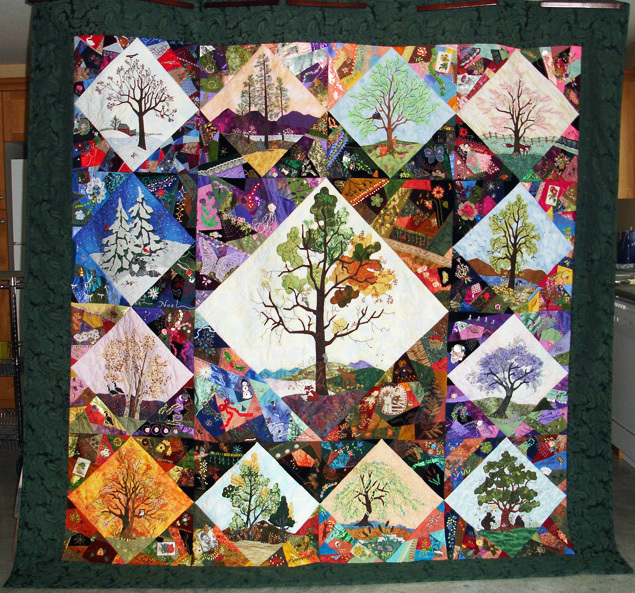 The crazy patch quilt was finished in a couple of years; while the 2007 quilt was finished in 2015 after completing the quilting. I modified the center for a more continuous flow to the quilt. 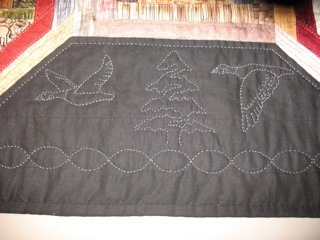 This is my first completed hand appliqued and hand quilted piece that I've ever made. 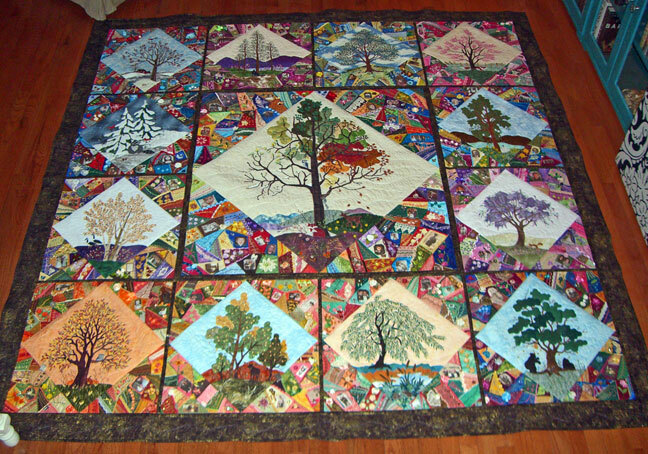 The 2007 Times and Season Quilt was a gift to my mom. 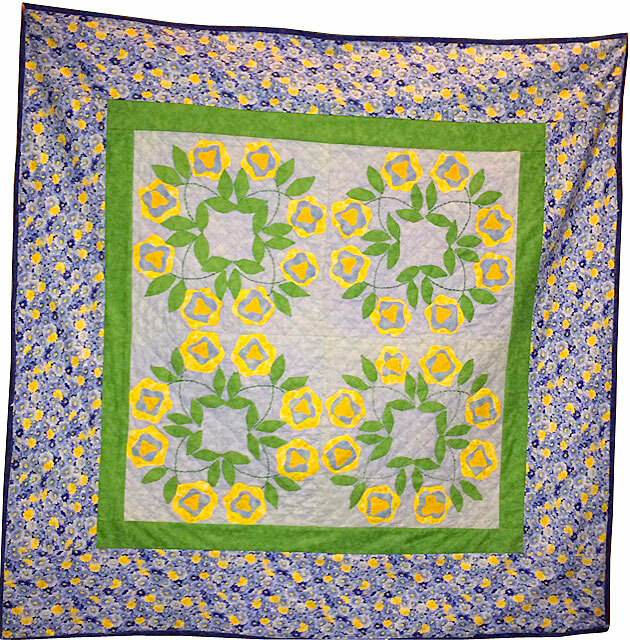 The quilt label reads: Made for Joy Gardner, my mother that brings "joy" to my life. I devised patterns for leaves for the trees that were supposed to use ribbon embroidery and satin stitched each and every one! down, including hundreds of 1/8 inch circles for the cherry blossoms, and a bazillion leaves under 1/2 inch long. 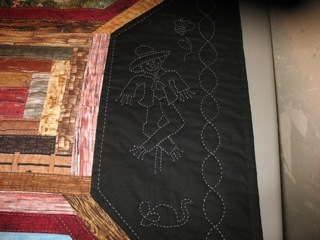 :) The crazy quilt sections were also done by machine, with even the buttons and charms being sewn with a button foot. Some flatback doo-dads were glued on. 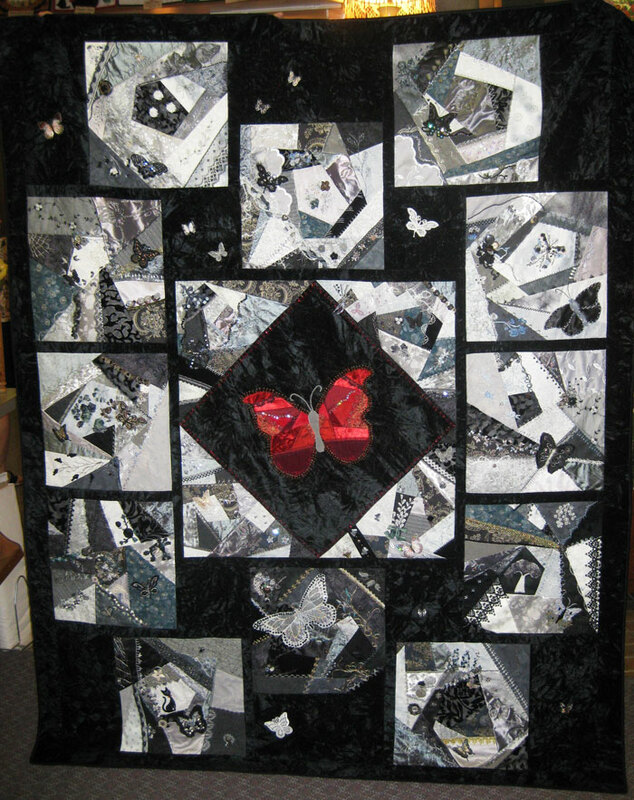 I turned the crazy quilt sections into a family photo memory quilt... 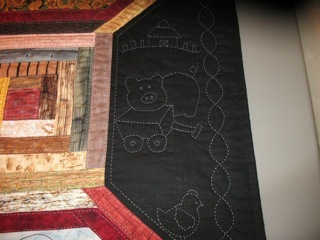 I thoroughly enjoyed making the quilt and appreciated the intricacy and details of each pattern. It will go to my grandson one day and I hope that it will become a cherished family heirloom quilt. Many thanks for such a wonderful pattern! 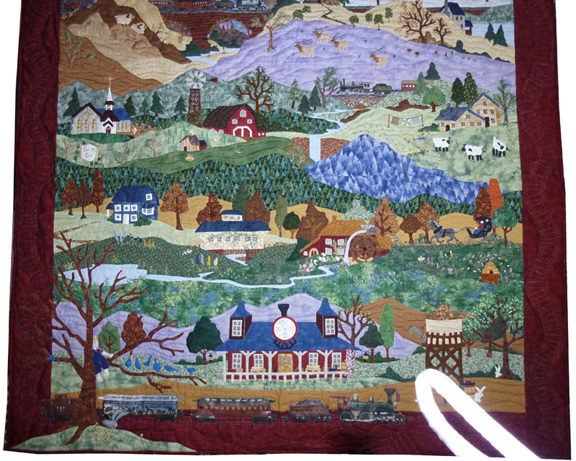 Mary wrote, "I promised to send a photo to you when I finished the quilt and as seen in the photo, I can happily say that I finally finished the "Wild Summer Roses" quilt from Piecemakers [Times and Seasons Calendar] 1991 and given to me as a birthday gift. The finished quilt is a (very!) late wedding gift to my daughter and son-in-law and is now on its way to France as a 'Christmas and late-wedding gift.' Thanks ever so much for your help and your encouragement. I don't think I would have been able to finish the quilt without it. Yes, this is a first time ever quilt for me!" 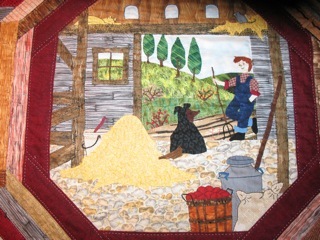 Jennifer wrote, "a tribute to my husband who loved to see me making it but died in 2007 so never saw it finished. The centre block is our family "tree" with pictures of us all and fabric from my dresses their shirts etc... Finished earlier this year . Thank you for the pattern." 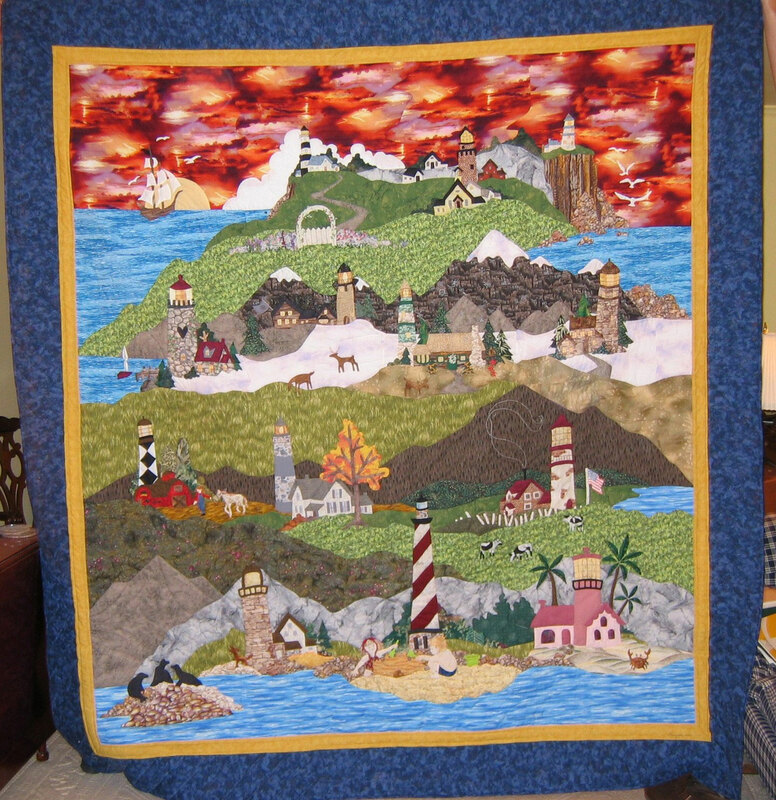 Helen wrote, "I have greatly enjoyed making this pattern over the past two years. It was a gift to my husband for his 70th birthday this past Friday. He loves trees and enjoys working with his bonsai collection, so it was a perfect fit. It now hangs in his office at home. 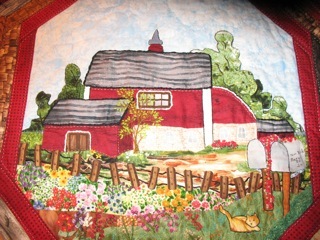 I have been sewing for most of my life and am a self taught quilter since 1984. I also teach many classes at local shops. I have made a few hundred quilts using a variety of techniques. 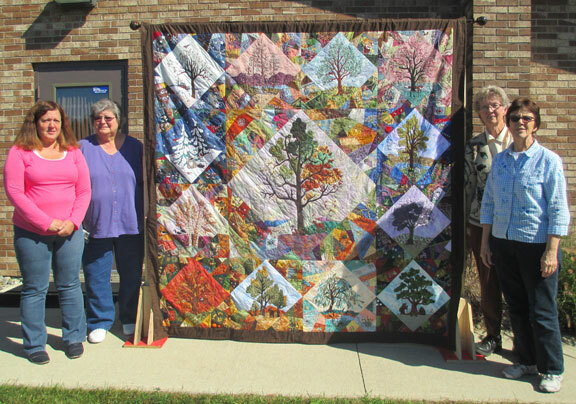 The quilt, with much encouragement was entered into the local quilt guild show with 130 other quilts. It won two vendor choice awards. The viewers choice award will be awarded at the next meeting so we will see if it makes it or not. Thank you for making such lovely patterns." your archives. It was completed in 2003." 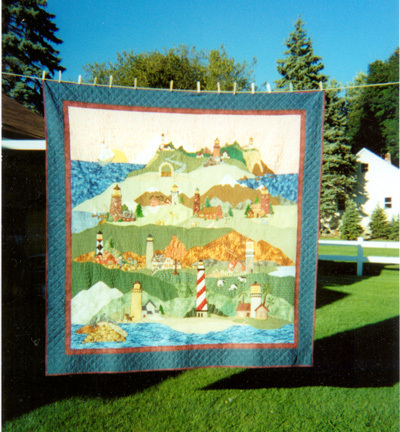 Maureen wrote, "Above is a photo of the quilt I made from the 2002 calendar. Took me five years to make but it is absolutely beautiful." painting to make the hay look more realistic. I did use a permanent ink pen to do the facial expression on the boy and some outlining. The cobblestone was just stones all together so I used white acrylic paint to paint out some of the stones so it would look like cobblestone." 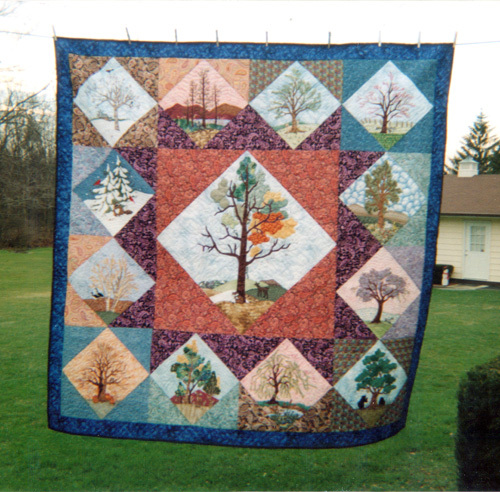 Shirley wrote, "After finishing the blocks for the 2002 Times and Seasons Quilt, I realized I did not want to crazy quilt the background as the pattern called for so decided to design my own background for the blocks and this is the result. 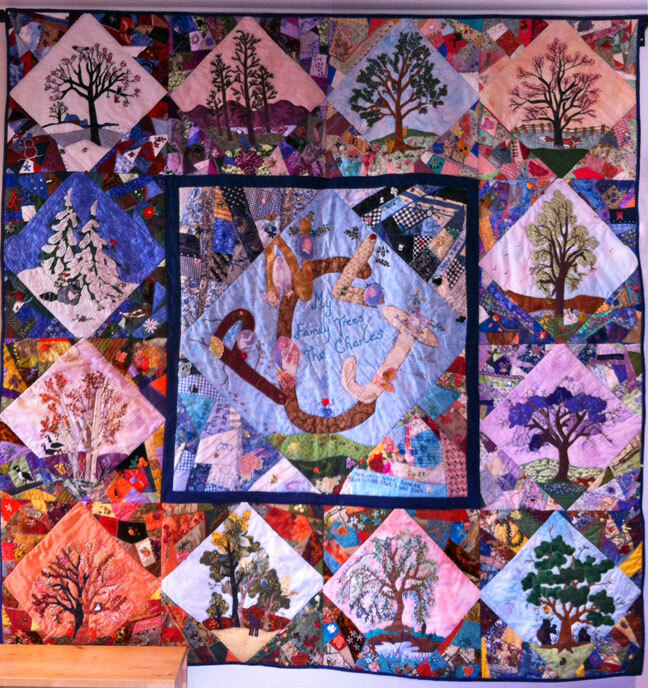 The quilting entails a lot of animals and birds in the background tree branches which can't be seen very well in this picture. 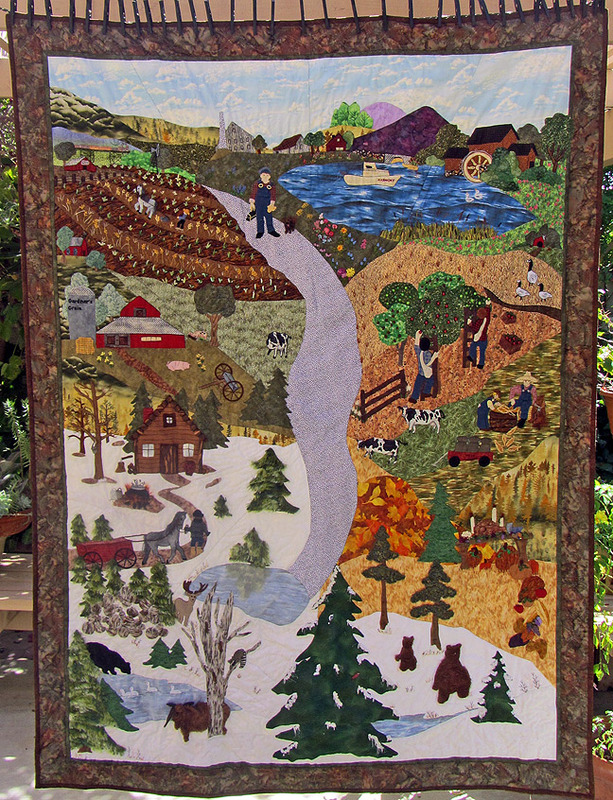 This quilt won Best of Show at the local Lake Farmpark Quilt Show." 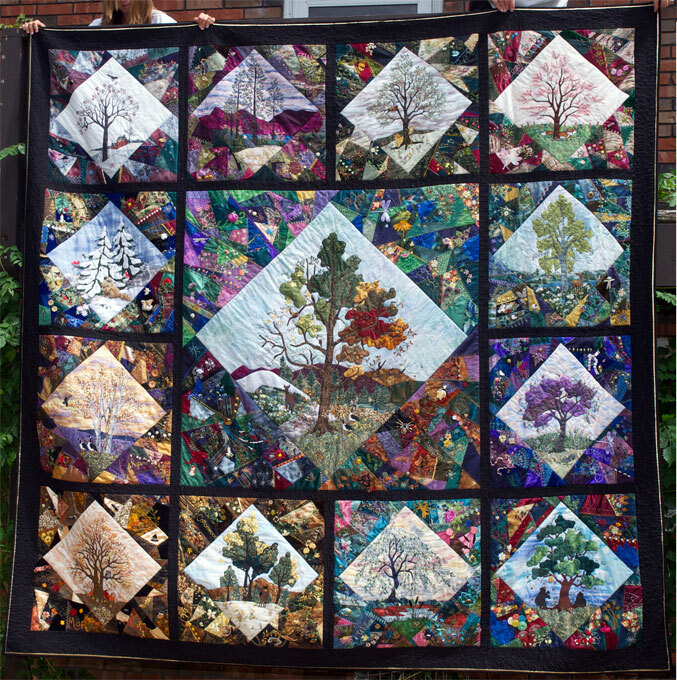 "These women accepted a challenge to make this Crazy Quilt from Piecemakers' 2001 Times and Seasons Calendar. For some, the random placement of scraps in various sizes, colors and fabrics was a new experience. For others, it was a pleasure to build on those simple stitches learned in our childhood and achieve the detailed and intricate embroidery decorating the patches. For all, learning the technique of creating silk ribbon flowers was the biggest challenge." 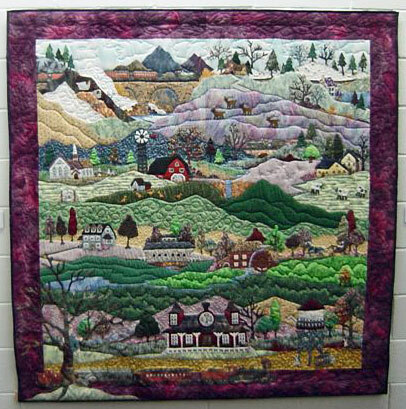 Piecemakers Note: Heather has a wonderful shop/studio named "Heather's Quilting Palette"
"We met every Monday since last Jan to work on this quilt....we enjoyed working on it during the week and coming together each Monday to see what the others were doing....we helped and challenged each other as we each learned new skills." 2016 UPDATE from Jan: "It won viewer's choice ribbons in Denver, Dallas, Madison, Wichita, Oklahoma Cit and he Kansas State Fir. 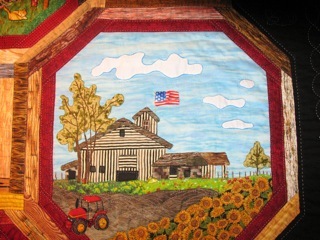 It won blue ribbons in Denver, Dallas, Wichita, and best of show in the professional category at the Kansas State Fair. It was entered in Paducah, Kentucky but didn't place." A HEARTY CONGRATULATIONS TO JAN! 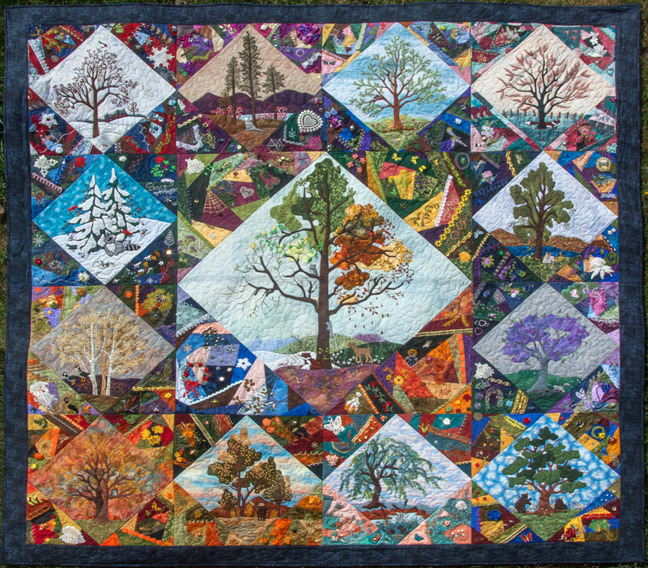 "Here is my version of 2000 Times and Seasons Train Quilt. It was lots of fun to make." 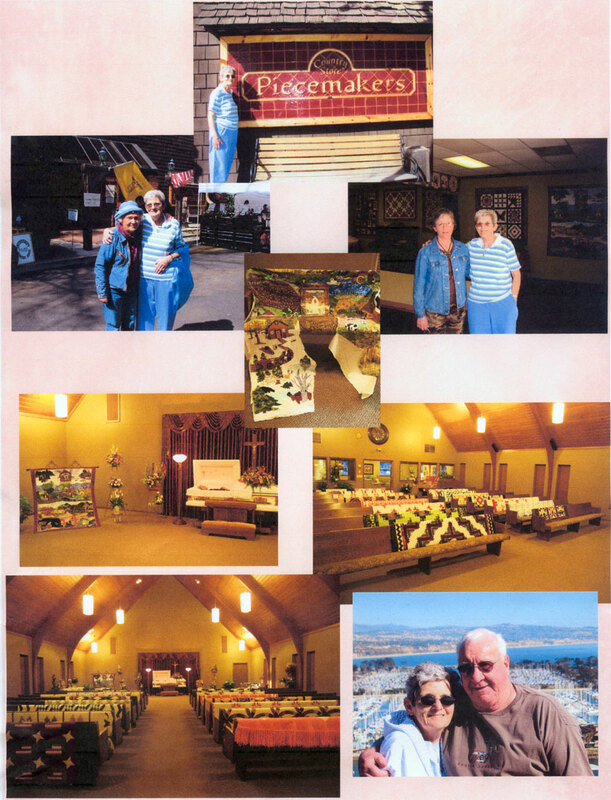 "Last year my friend, Carolyn Larsen gave me your calendar as a present. 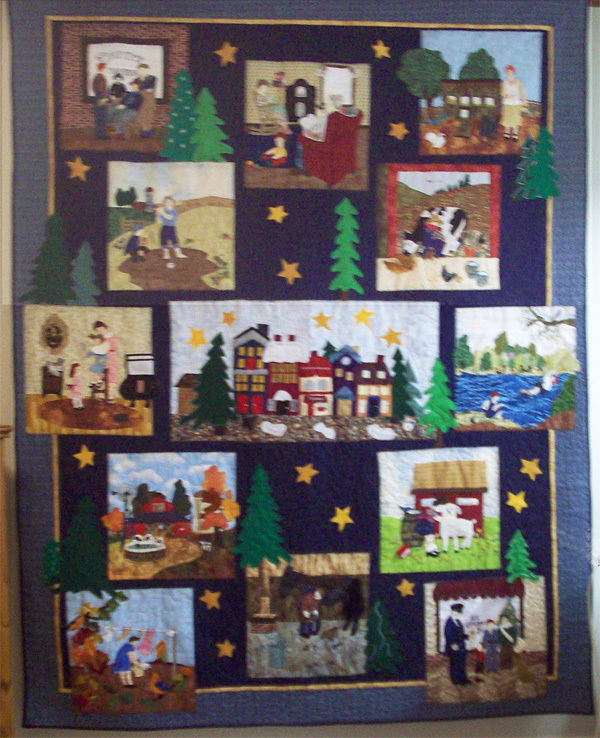 I loved it and as our family was having our first big Christmas together for many years I decided to make the quilt as an Advent Calendar to celebrate our time together. I finished it! Lots of work, lots of fun. As I hope you can see I have altered a few blocks to give them an Australian flavour, so Santa is surfing ( after Christmas, of course!) and instead of reindeer we have six white kangaroos. This is for a song by Rolf Harris, an Australian Singer who wrote, 'Six White Boomers' - another name for kangaroos! Where Santa is climbing down the chimney, I included Australian animals and birds and where you had an orphanage, I didn't feel happy about that so I made him a farmer with two calves... Thank you so much for your lovely inspiration." 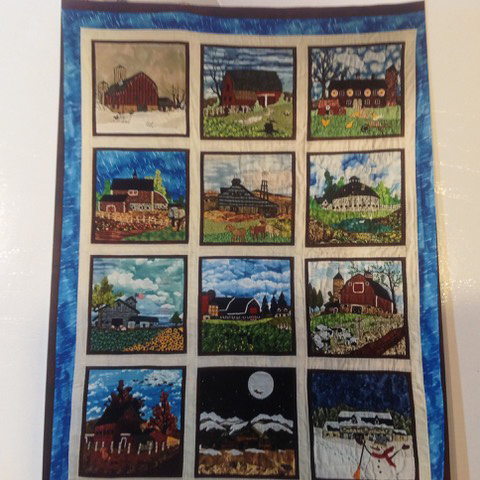 "I was unfamiliar with your Times and Seasons projects until I got this calendar from a quilter friend who decided she was never going to get it made. 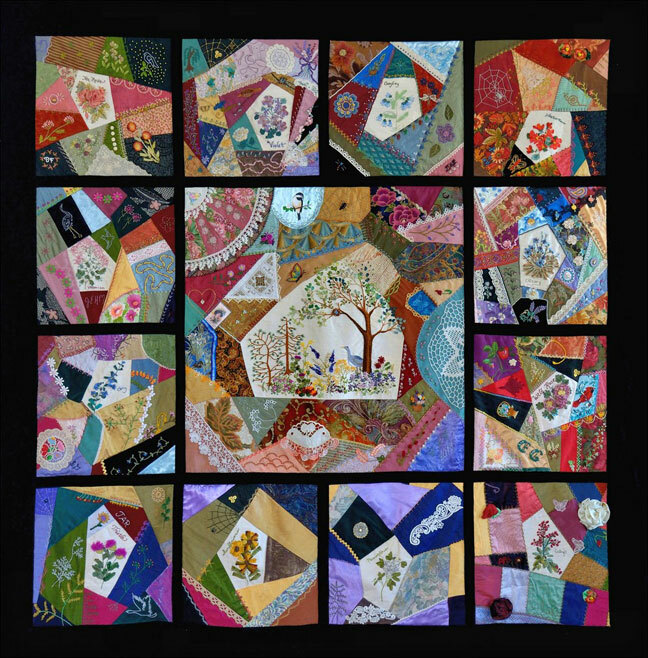 I enjoyed the whole process of finding fabrics, embellishing the crazy quilt blocks, and occasionally adding my own spin on your very good patterns. 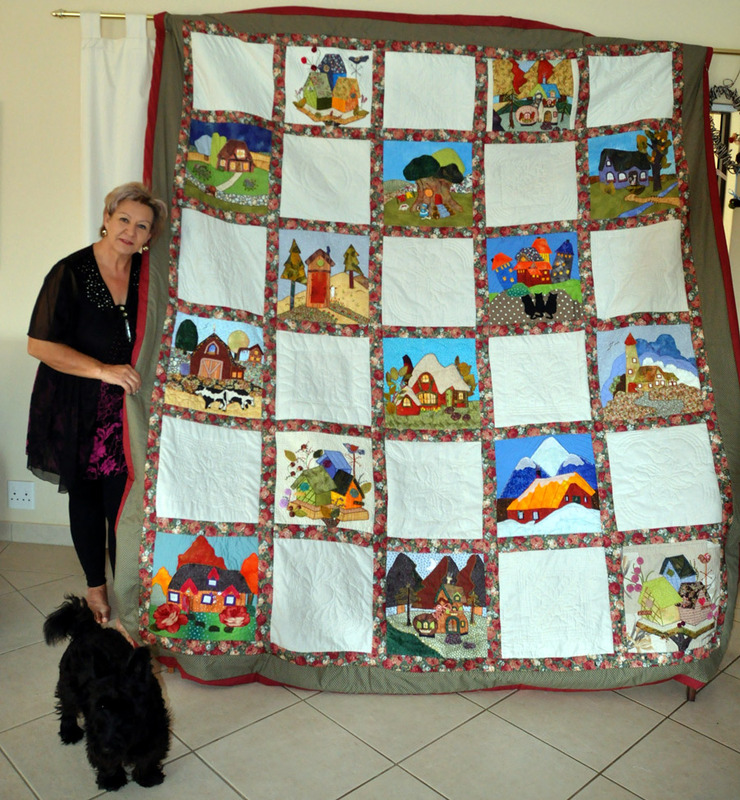 Thank you for adding to the joy of quilting for a great many fellow quilters!" 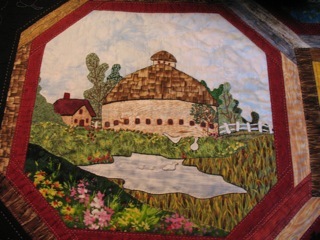 quilt and been accepted into the AQS show. 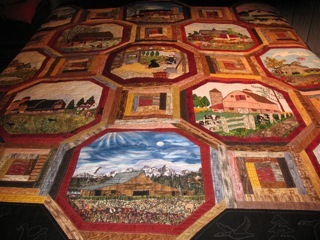 It is a beautiful quilt and has brought joy to so many that have seen it! Thank you for the work that you do and the patterns you share. 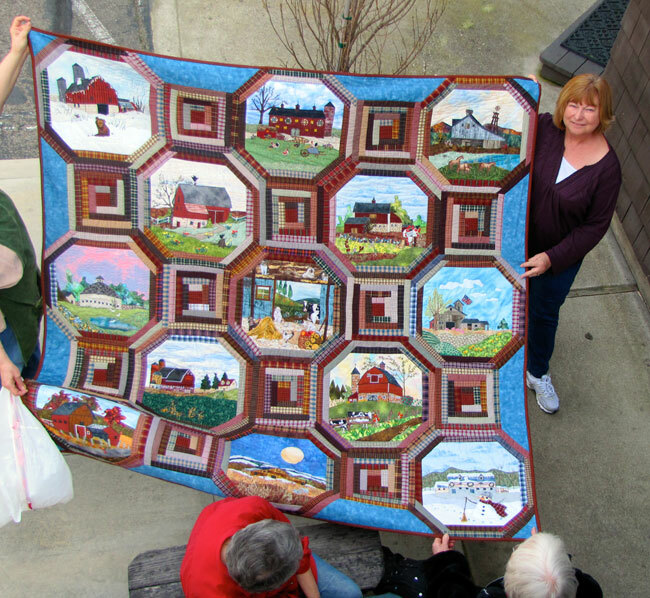 Our guild has always oohed and aaahed when a Piecemakers quilt is shown in "Show and Tell" by someone." "My version of your fantastic pattern. Finally, It's done!!" 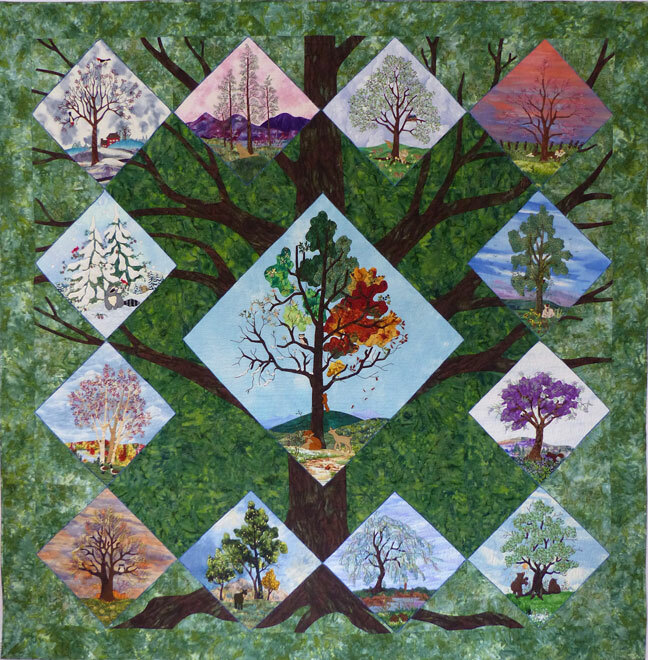 "I adapted the pattern and included my family in the people of the quilt. My mother, who passed in 1993, was the lady being baptised and all the family was gathered to watch. My grandchildren were the kids. 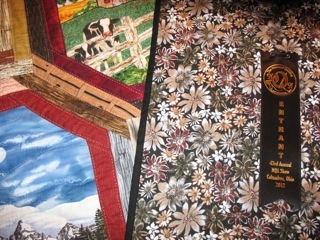 I won an honorable mention in the Kirksville, MO 2007 quilt show and a second place in the Port St. Lucie show in 2008. 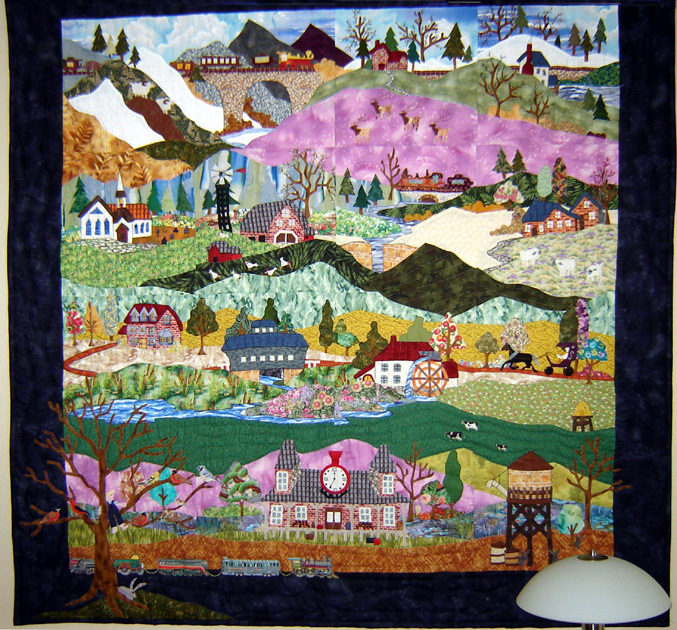 It still hangs in my living room and I recieve many compliments on the quilt. Thanks for allowing me to share." 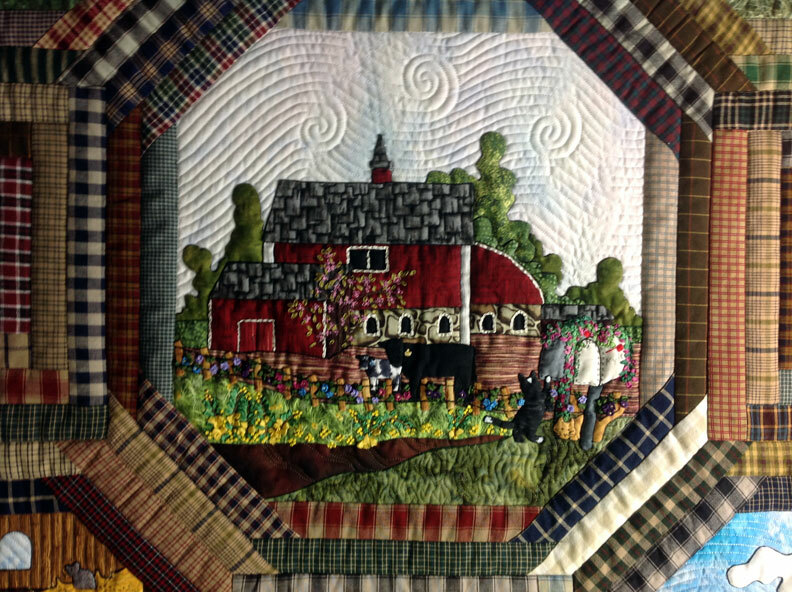 "Thank you so much for your permission to show one of your patterns (1999 Times and Seasons) in the Canadian Quilt Show that was held in London recently. 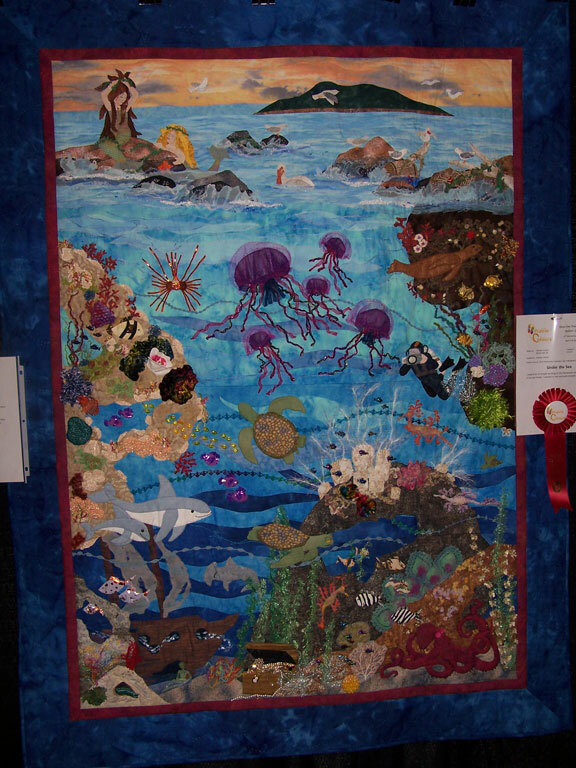 I won 1st place in Traditional Pattern for Excellence in Workmanship - Applique. Another one of your patterns won a Best of Show for me in The Chatham Kent Quilters' Guild 2007 show." 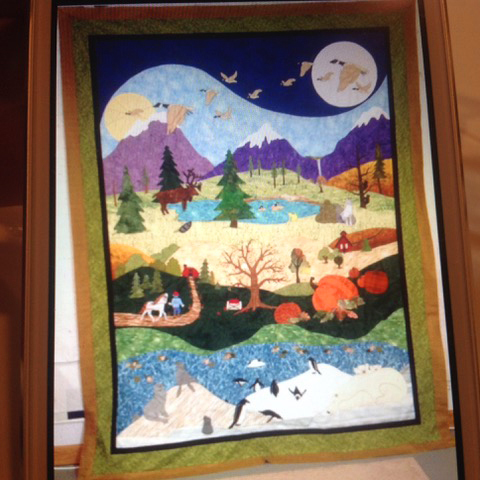 Sue brought her finished quilt to Piecemakers and we were able to get a picture of it while all the Piecemakers were admiring it! 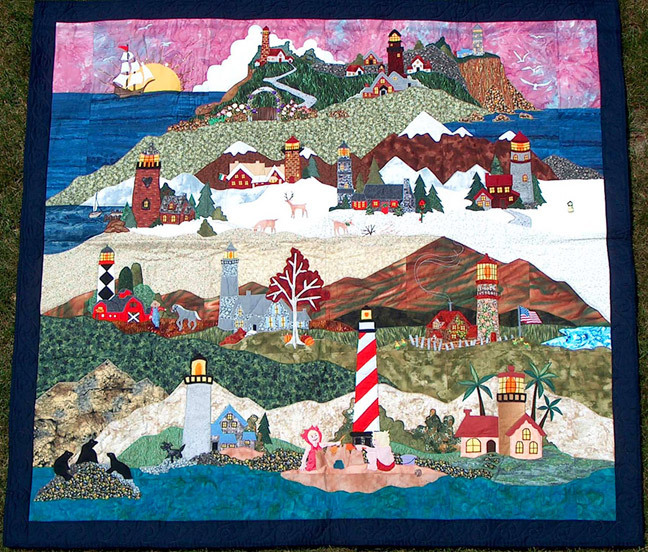 Sue machine appliqued her blocks and machine quilted the top. We were impressed with the changes she made on the blocks to personalize her quilt. "To everyone at Piecemakers, thank you. 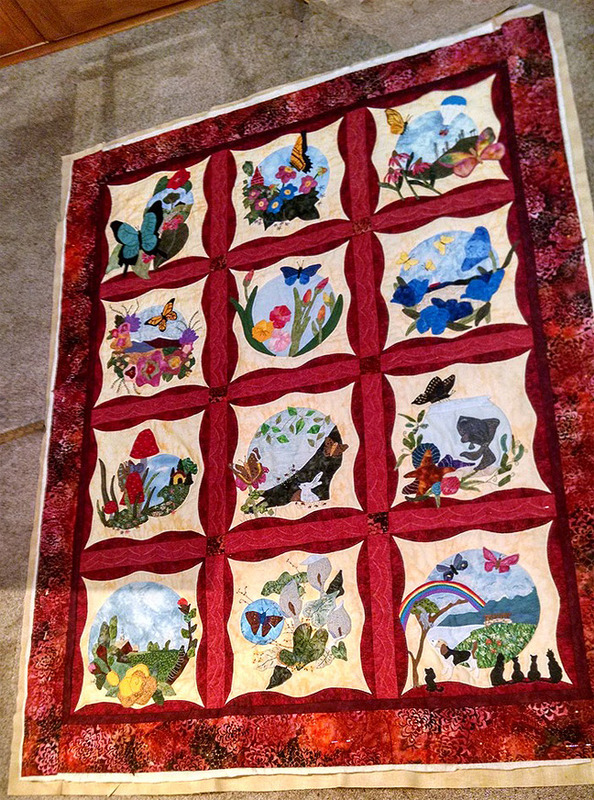 The Out of the Darkness quilt project was a delightful prayer to God. 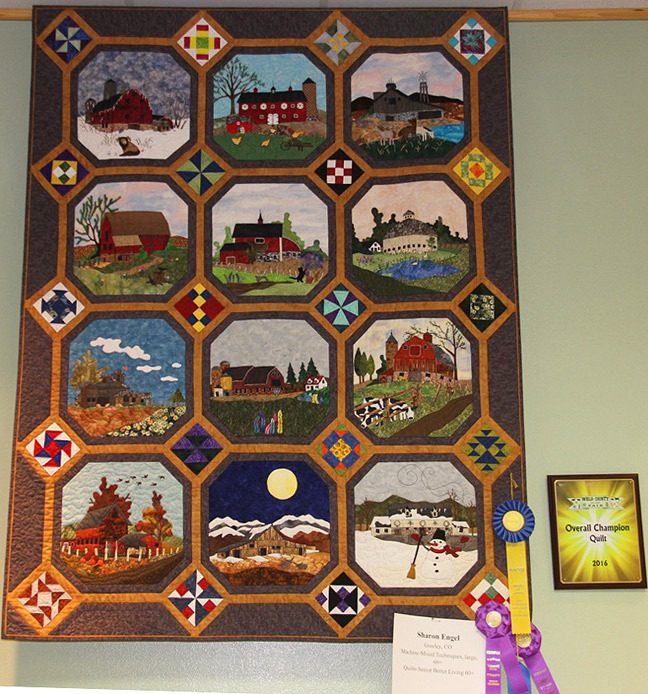 This picture is taken at Quiltopica, Greenbaum's 3rd annual quilt show in Salem, Oregon. 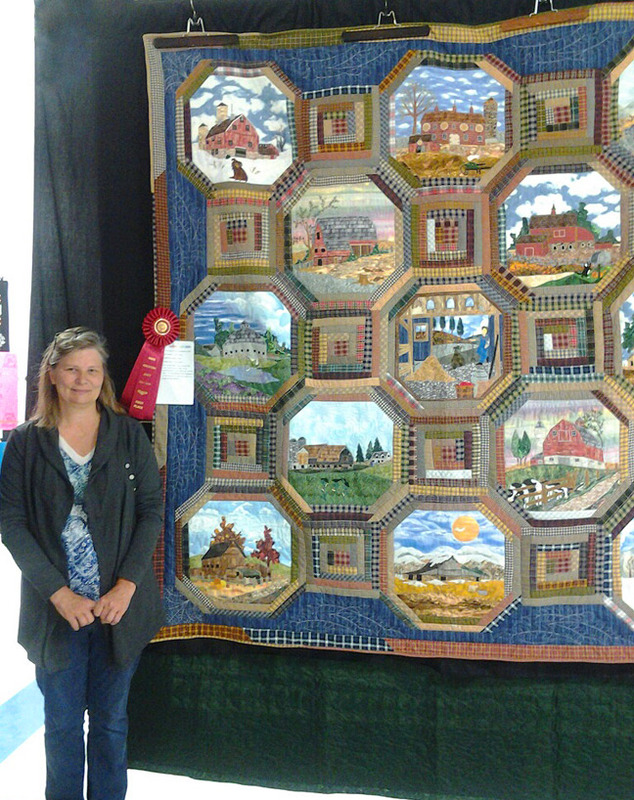 This quilt won the Viewer's Choice award on day 2." 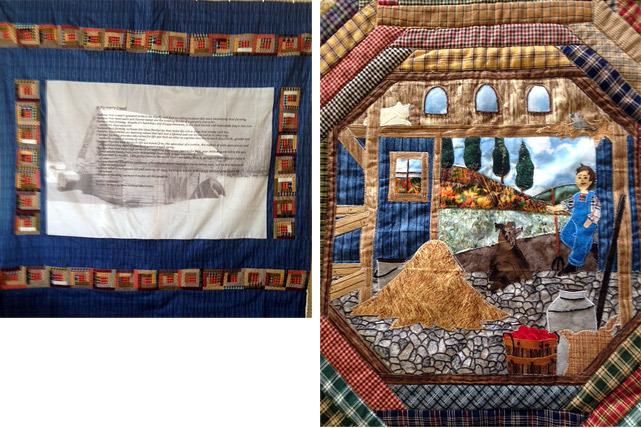 "These are photos of my two quilts made earlier from your calendars several years ago. The train one is in a local exhibition, and is getting a lot of attention which is very pleasing. " "I finally finished the trains quilt and I love it. I loved doing it. 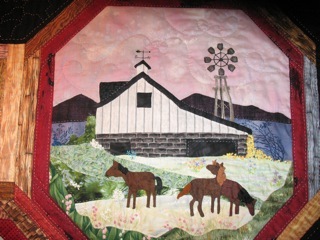 I also finished the barns quilt but have not yet quilted it. Thanks so much for printing the train images for me several years ago." "I redrafted this in EQ5 to be large enough for a queen size bed. Picking fabrics was a lot of fun; but appliqueing buildings was tedious. I was much happier doing the more organic shapes - animals and trees. The silk ribbon embroidery was new for me; the flowers came out quite well." 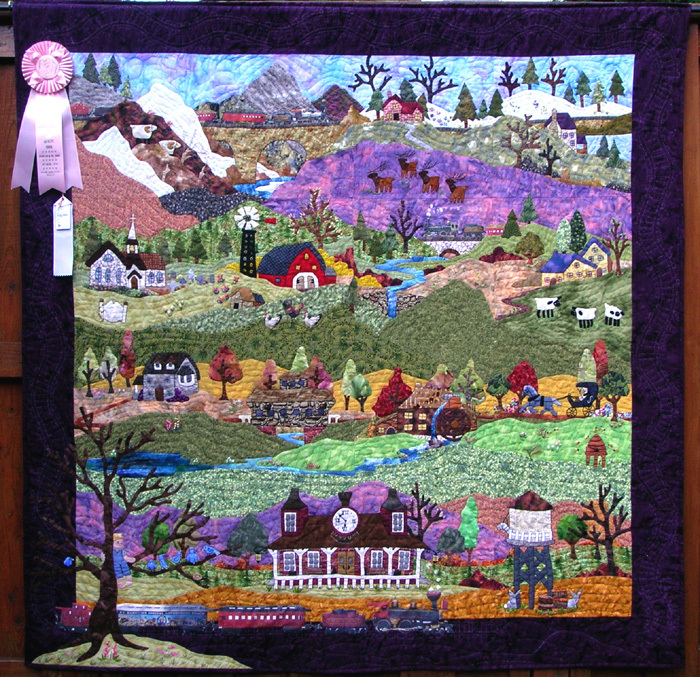 Susan won several ribbons for this quilt - 2005 Salem VA Fair: Best in Show, Director's Award, Champion; Mountain Comforts XVII in Ferrum VA: Best in Show and Viewers' Choice; 2005 Floyd VA Guild Show: Honorable Mention. Congratulations, Susan! 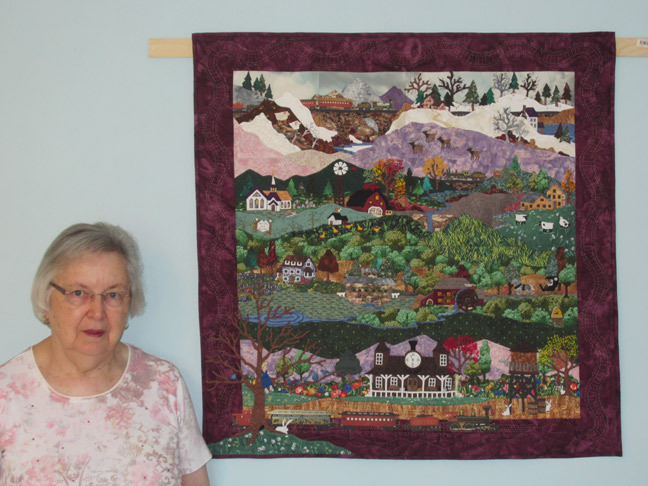 Her friend Patty sent us the photo of Corky and her quilt, and wrote, "Corky's full name is Corrine Linscott, but I have never heard anyone call her "Corrine," only "Corky." I did call her and read your very nice note to her. 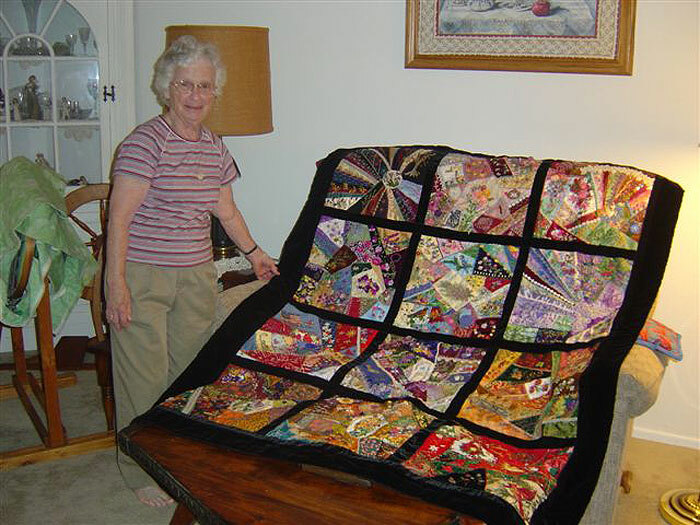 She was absolutely thrilled that you were impressed with her quilt and said that she feels very "humbled"... Thanks again for making Corky so happy." 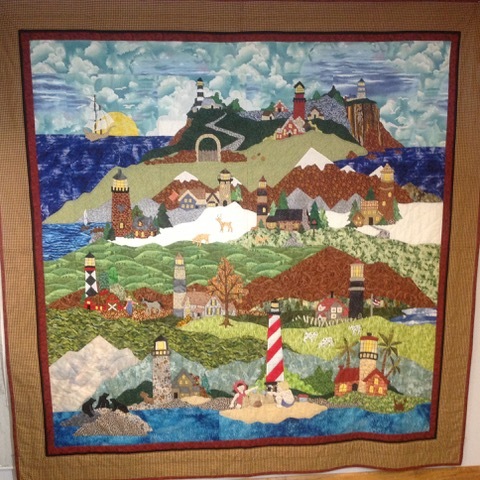 She wrote, "I have made several of your wonderful calendar patterns - the Lighthouses, the Trains, and now the Churches in the Wilderness, and I really enjoy doing them. As you can see, I have adapted it to flow through the seasons of the year starting with January and ending with December. 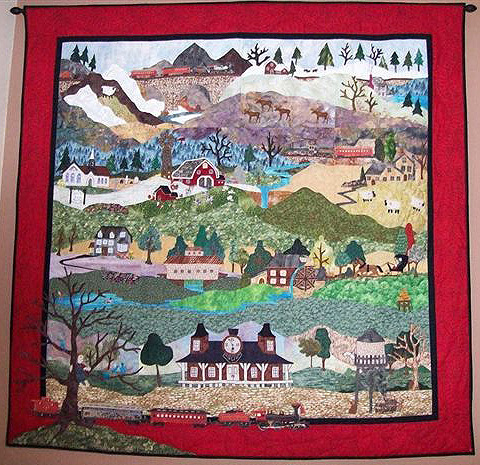 The first quilt show I want to enter it in is the Mountainfest Quilt Show in Pigeon Forge, TN, held March 6th thru 10th. I will let you know if it places. 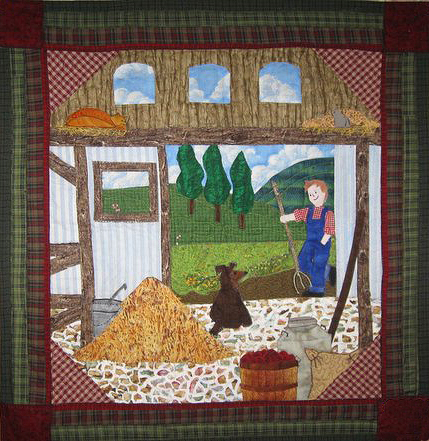 Also, I need to tell you that I needleturn appliqued the quilt, and it was longarm quilted by Pam Heavrin of Paducah, KY."
"To the Ladies of Piecemakers: I asked my daughter to type this letter of thanks to let you know just how much I appreciate your kindness at this difficult time. Losing my beautiful Barbara after 61 years of marriage has been quite difficult. She wrote, "I had a really good time making this rug. It's very heavy." 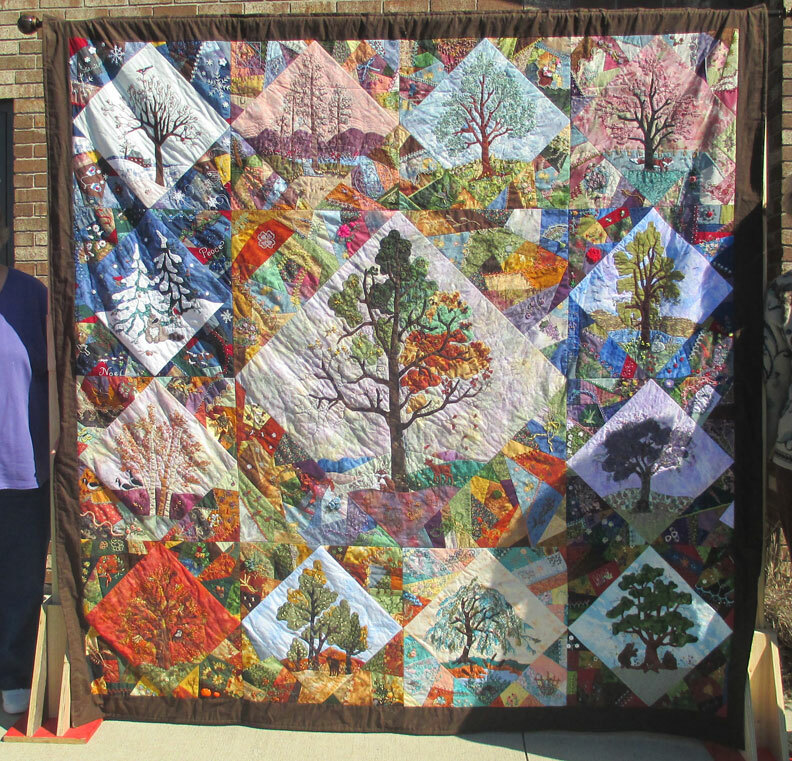 Joyce has made two 2009 calendar quilts! "Englehart, Ontario, Canada is a small Northern community just having celebrated our 100th birthday in Aug 2008. 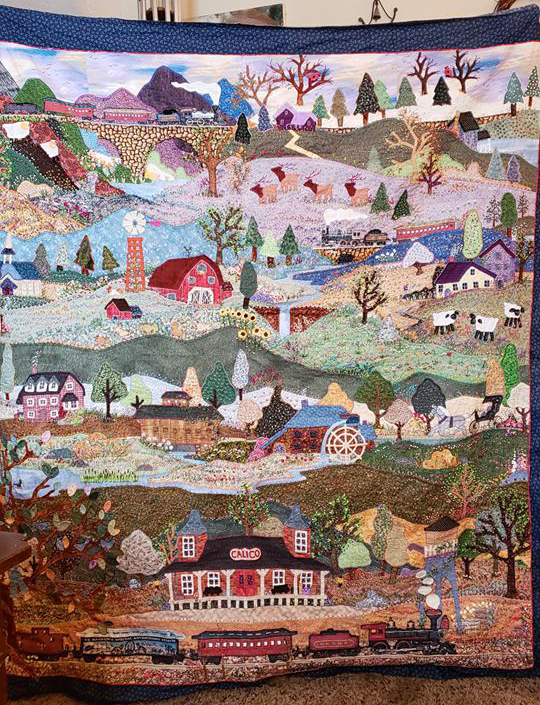 This quilt tells the story of our past 100 years. Railroading ,agriculture, farming, forestry, and mining. 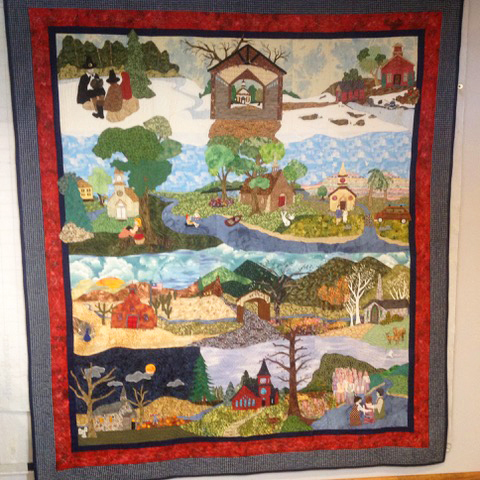 June 2008 our Train Quilt was donated to Ontario Northland Railway - it now hangs in the Passenger Service Ticket Office in Englehart for the public to view"
not enough time. Thank You again. 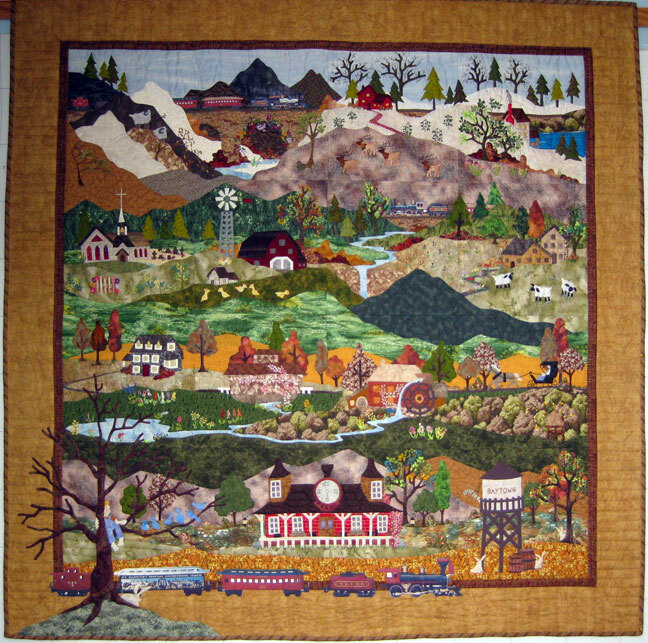 Says her husband, Tom: "Rhoda completed this very complex and intricate quilt on December 29, 2007, after hundreds of hours' effort over several months. 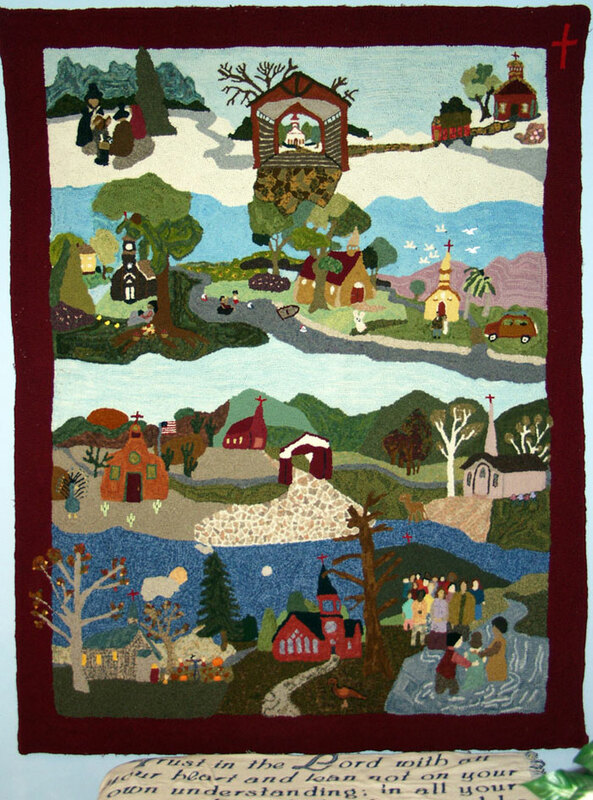 Rhoda entered her "Times and Seasons Quilt" in the York (Pennsylvania) Quilters' Guild Celebration of Quilts, exhibition of 2008, winning two prizes: Third Place and Viewers' Choice." 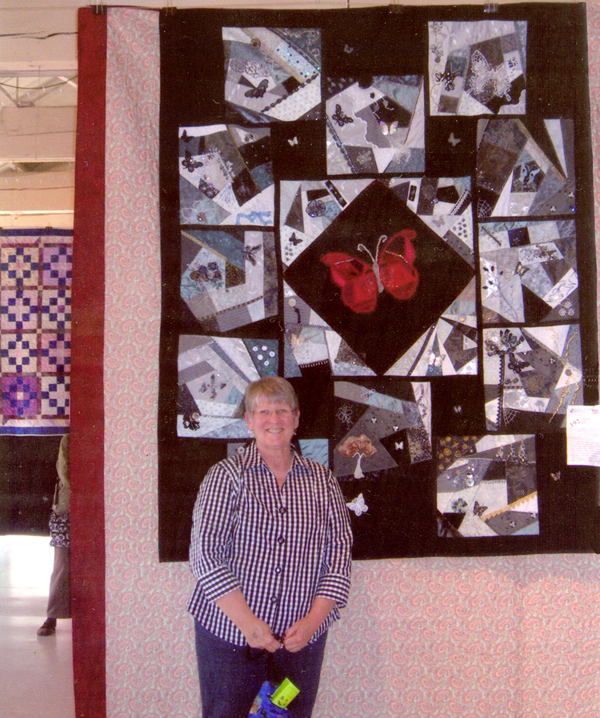 "I fell in love with the 2002 Piecemakers Calendar quilt when I saw it made up and displayed in a booth at Puyallup Sewing Expo. Last year my granddaughter asked me to make her a quilt. I showed her a lot of patterns but... the 2002 quilt was the one she wanted me to make. 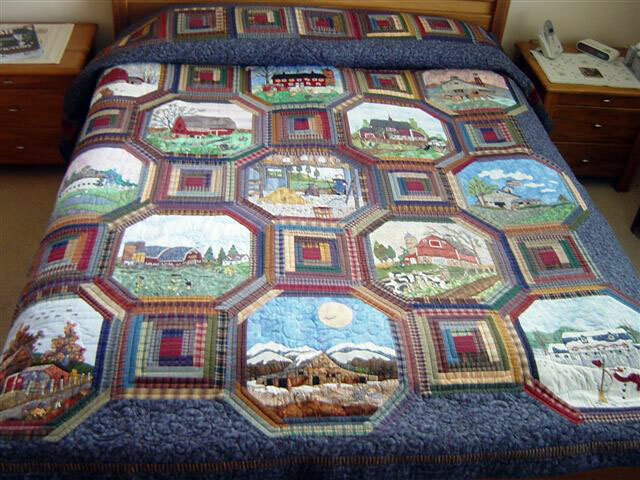 This quilt was a challenge but the instructions were very good." that I'm making all alike at the same time. " 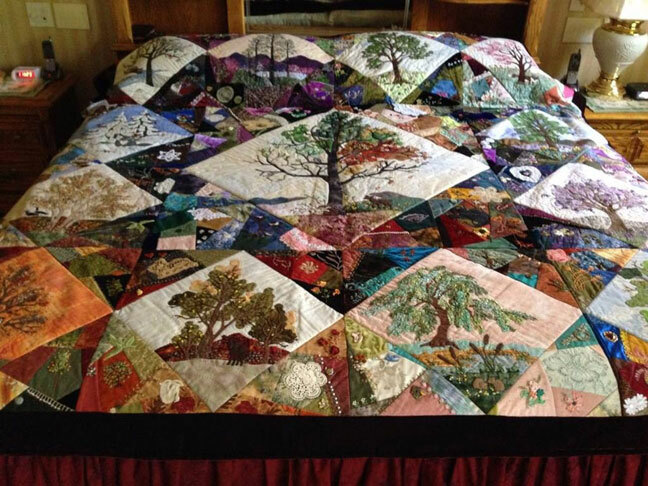 "I usually give most of my quilts as gifts, but when my daughters asked who I was giving this quilt to, I said it would be their inheritance as I could not part with it. 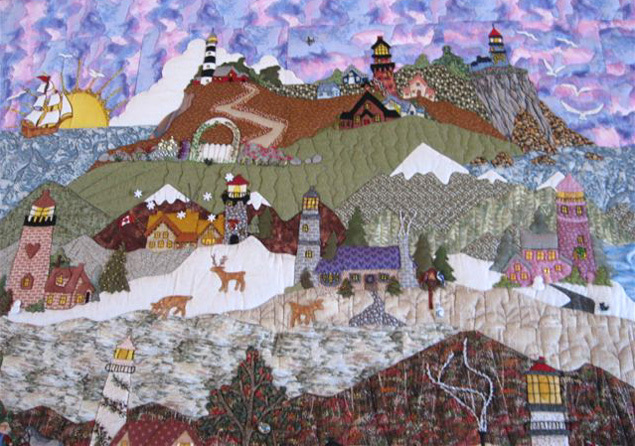 Thank you for the beautiful design and I hope you continue to challenge quilters world wide. God bless you." 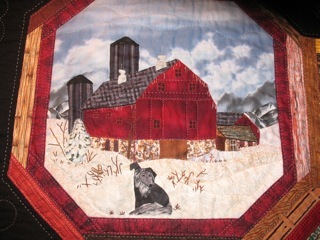 "I've enclosed a couple pictures of quilts I've made. My favorite is the 2003 Farms [not pictured]. I love it. 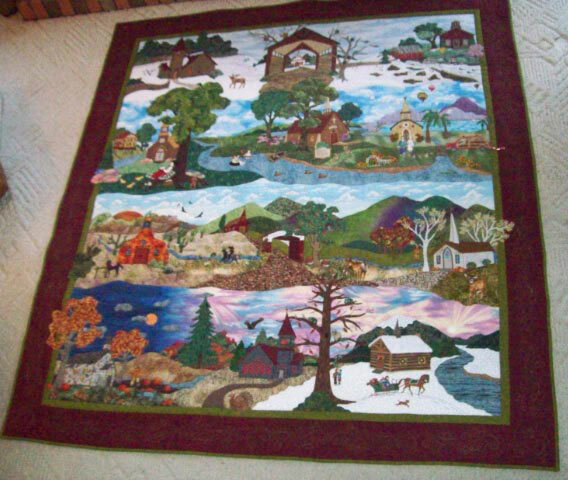 I just finished the 2006 quilt and I'm ready to start another."